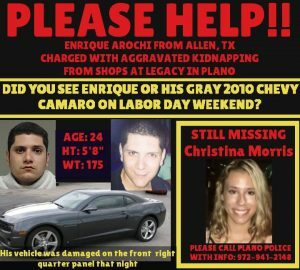 What Happened to Texas Missing Person Christina Morris? Friends, family and co-workers of Christina Morris could not locate her after she left a party on August 30, 2014. In September 2017, Dateline featured her story. You can watch the entire episode here. My deception analysis is included below. The analysis is taken directly from Enrique Arochi’s own words on the transcript and video, which has been reviewed multiple times to ensure each word is his. The analysis must be on verbatim to be accurate. Police interviewed a former high school classmate and then-person of interest, Enrique Arochi who was also at the party that night. They questioned him about his car being shown on video footage as being in the same parking garage where Christina’s car was parked, yet he initially told police they parked in separate lots. Detective: Has she ever been in your car? Enrique: No, I do not. Enrique: No I didn’t. I wouldn’t hurt h- (started to say her, then changed it) anything, not even an animal, a fly, nothing. “Wouldn’t” is a deceptive word. “I wouldn’t hurt” doesn’t mean he didn’t hurt. For what it’s worth, I certainly would hurt a fly if that sucker were in the room and I could swat it! Enrique: I have no idea. I wish I knew. ** “I have no idea” or “I don’t have a clue” are deceptive responses. Everyone has at least some thought or indication what may have happened. To say they have “no idea” is a way of withholding information. 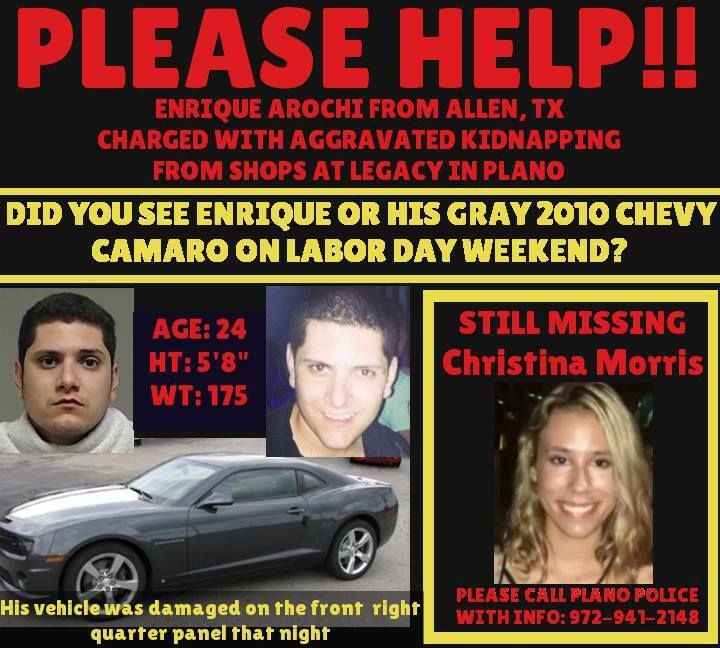 Three months later, Enrique was arrested and charged with aggravated kidnapping. The Dateline episode said that the police also believed he killed Christina but they did not have a body or a crime scene, which would make getting a conviction much more difficult. During the trial, a CSI expert testified that they did find Christina’s DNA inside the trunk of his car. In December 2016, Enrique Arochi was found guilty of the aggravated kidnapping charges. He was sentenced to life in prison. Family and friends continue to search for her every weekend. As Managing Director of Concealed Statements I work with men and women who want to increase their deception awareness to avoid wasting time or money and avoid making poor decisions based on inaccurate information. Be sure to connect with me on LinkedIn, Facebook, and Twitter. If you liked this article please Like, Share, and Post a Comment. As Managing Director of Concealed Statements I work with men and women who want to increase their deception awareness to avoid wasting time or money and avoid making poor decisions based on inaccurate information. Don’t Miss A Thing! SIGN UP for updates & upcoming class info. Why Is There Deception In Your Relationship?